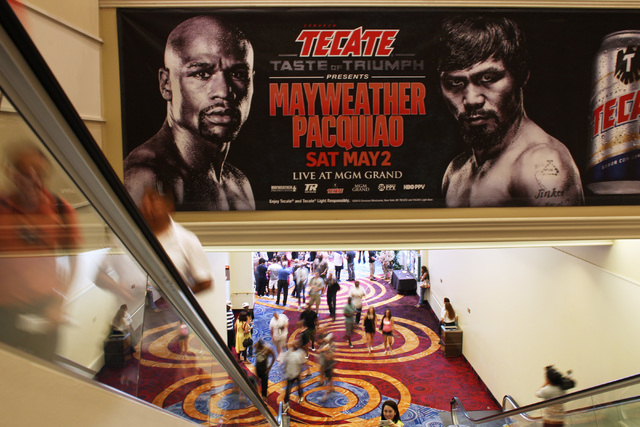 Floyd Mayweather Jr. is about a 2-1 favorite over Manny Pacquiao in Saturday’s fight at the MGM Grand Garden. Here’s a survey of opinions from Las Vegas Review-Journal staff members, other media, oddsmakers and professional handicappers. Another methodical performance by Mayweather, who will cruise to victory. Arguably the best defensive fighter of our time, Mayweather finds a way to outscore a motivated Pacquiao in a close-scoring decision. Floyd will provide flawless defense, but Manny will stalk him around the ring and end the rounds with flurries. Mayweather will moan that he landed the cleaner blows (and he will be right), but the judges will reward Pacquiao’s high work rate and aggressiveness with a controversial decision that begs for a rematch. Pacquiao presses the issue from the opening bell, but Floyd’s defensive prowess and ability to counter punch wins the day in the judges’ eyes. Pacquiao will have his moments, but in the end, the judges will give the nod to Mayweather and the ‘0’ remains intact. Superior tech skills keep Floyd perfect, but I suspect this is close enough to warrant the megabucks rematch. I keep looking for ways for Pacquiao to win this fight, and every time I come up with the same conclusion — size matters, and Mayweather is going to have a real advantage against Pacquiao. Floyd can’t knock out Manny, and Pacquiao isn’t as fast as Mayweather, so this is going to be a close one with inevitable controversy, therefore I’m going with a draw and a bigger-money rematch in the cards. Pacquiao’s aggressive style will be rewarded in a controversial decision that will set the stage for a rematch. All the pressure is on Mayweather, who cherishes his unbeaten record, and it will come down to a decision and the three people in the worst spot in the universe on Saturday night will be the judges. Mayweather will be too elusive for Pacquiao. This sets up the hype for the rematch. My pick is Mayweather because of his outstanding defense, boxing ability, size advantage and counter-punching ability in a fight that he could win eight rounds to four or nine rounds to three. It should be a competitive fight with Pacquiao challenging Mayweather for the full 12 rounds. History has shown when the bigger fighter is also the better defender, that’s a winning parlay, which means Floyd prevails by decision. It’s boxing, so doesn’t it make perfect sense that the most overhyped fight in history will end with all hell breaking loose? Pacquiao’s style is probably the one you’d want to use if you picked a fighter to beat Mayweather, but Pacquiao is open to be hit and available for counters and Mayweather is so aware in the ring that he will make the adjustments he needs to make and win. Floyd is a brilliant tactician whose knowledge of how to impress the judges makes him the more likely of the two fighters to cause frustration and a deviation from the game plan, enabling him to wear down Pacquiao and win the close rounds. The Money Team makes its biggest deposit yet, but will it be memorable? You can’t beat what you can’t hit, and Pacquiao isn’t fast enough to hang with the champ. There is just enough from Pacquiao’s corner to warrant a rematch, but TMT cashes again. This will be a close or controversial victory for Floyd, fueling the fire for fight No. 2. Pacquiao had knockout power five years ago — when these two should have fought — and might have caught Mayweather then, but he’s lost it and can’t win a decision. Pacman in a close decision — the first time ever I liked opposite Mayweather. Floyd remains savvy enough to stay out of harm’s way and pile up enough points to take what likely ends up a rather lackluster decision. Manny early, Mayweather late, and the hype has only just begun for the rematch. A one-sided fight all the way, as Mayweather is just too fast. It’ll be close, and Pacquiao will have a chance to pull it out late, but Mayweather is just too good and he’ll win again. Mayweather is still a superior tactician and boxer, and the only way I see Manny winning is with a lucky shot, something that rarely happens to Mayweather. Since the possibility of the fight first came up in 2009, I’ve thought it was a fantastic style match and that Mayweather would beat Pacquiao by decision, and five years later that’s still my opinion. Floyd has had the most calculated career of any modern-day boxer, he doesn’t take this fight unless he knows he can win, and he got the perfect referee in Kenny Bayless to let him clutch and grab. This is like a blue-light special at K-Mart with slashed prices, and I can’t resist playing the best fighter in the world at half the price it should be. Why change what has worked 47 times — the fight will heat up in the middle rounds, but the late rounds will go to a defensive and counter-punching Mayweather (116-112). “Money” spends most of the night backing up, and the fight is a bigger letdown than the Apple Watch. Expecting Pacquiao to come at Mayweather early, but Mayweather to squeeze out more rounds to take a close decision. Though I’ll be on Mayweather for the fight, there was a serious amount of value in the draw at around 15-1 odds because both fighters have been known to go the distance and “Money” Mayweather would draw his biggest payday ever with a rematch. My heart wants Manny, but my brain says Floyd stays away and outscores him with the jab, so for Pacman to win he needs a 10-8 round. The fighters should trade rounds back and forth, and there’s a decent chance (at least better than in most major fights) that Mayweather and Pacquiao each win on one judge’s card with a third scoring it a draw. Mayweather for the first time is fighting someone on the same level as himself, only with more power, and if Pacquiao starts strong, Mayweather will have to play catch-up and be out of his comfort zone. Pacquiao gets some big shots in, but Mayweather outlasts him and wins a close decision. He’s simply the stronger pound-for-pound fighter, and he has never lost. Mayweather by decision, maybe 8-4, after Pacquiao opens fast and wins a few early rounds. Pacquiao will force the action early, but Mayweather will win most of the late rounds and cash in a close decision.